The following is a guest post by Jenna Omassi, AMS VP Academic & University Affairs, 4th year UBC student, BA International Relations and Religious Studies. Open textbooks: the entrance into the realm of open pedagogy for most students and the most approachable way for students to get involved in the conversation surrounding open education. At least that’s how the Alma Mater Society (AMS) at UBC, Western Canada’s largest student society, sees it. Following the Open Education Conference, there have been some naysayers towards open textbooks, pointing to the need to steer the conversation towards open access more generally, rather than distilling the message to solely include OERs. I don’t disagree with that argument. I do though disagree in discounting the intrinsic value of open textbooks. 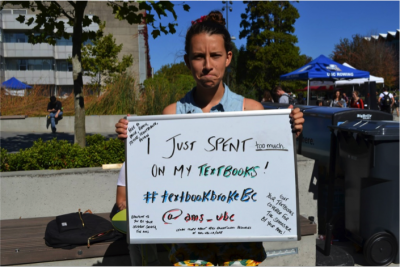 This year the AMS has been working with other student groups from across the country and partners within UBC Vancouver, to raise awareness of OERs and open education. 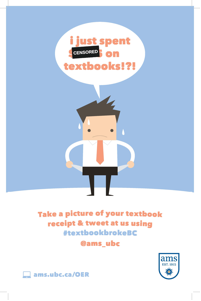 The most effective way of starting the conversation has not been through discussing the pedagogical benefits of open, but in mentioning the cost savings associated with open textbooks with the #textbookbrokeBC campaign. Cost is important to students, and textbooks are the educational resource students use most, which is why #textbookbrokeBC works. No, open textbooks are not the primary reason we are all working towards open education, but they are the lowest hanging fruit to engage students and faculty. Open access will happen because it is the right thing to do in order to ensure that knowledge is disseminated in the right way and because of a recognition that traditional educational practices simply no longer suffice, but that can only happen if more people are a part of the conversation. The way to bring more students and professors into the conversation is through social justice imperatives, not pedagogy. Simply put, most students have immediate concerns about affordability, and most faculty members about efficiency and ease of use. Moving beyond awareness, the importance of open pedagogy does not discount the importance of open textbooks for a very simple reason; open textbooks are not just free traditional textbooks. Open textbooks are customizable, prompt further reflection on the use of resources, and allow students to be a part of production. They allow for knowledge access beyond the classroom, and ensure innovation is promoted and made easy. Most importantly, open textbooks create further awareness of open education more generally. Open pedagogy has a link to the resources used and is completely connected to the quality and relevance of course material. The idea of incorporating students as producers of material can only happen if they have access to resources that support this initiative. Additionally, students will only be engaged in a classroom where their instructor has intentionally thought of curriculum-focused resources that are accessible to all students. Open textbooks are a needed part of the move towards open education. They are the unifying factor between those already a part of the open conversation and those outside of its bounds who are curious and thinking about getting involved. So yes, the Open Education Conference did have a large focus on OERs and Open Textbooks, rightfully so. If we are ever hoping to bring more people into this conversation and create awareness a low-boundaries approach is needed, and that is exactly what open textbooks provide, while still allowing for innovation and increased participation from those advocating already.